On the one side, the growth and extension of actin-based lamellipoidal protrusions that allow the cell to ‘crawl’ outwards, on the other, the formation of large contractile actomyosin cables that can pull the cell forward while generating traction forces on the substrate. However, the process by which the cell chooses to form protrusions or contractile cables remains unclear. Depending on the topography of the physical environment, cells may encounter regions of positive or negative curvature. Positive curvature refers to a convex shape that curves outward, much like a capital letter ‘D’, whereas an example of the opposite negative curvature can be seen in the letter ‘C’, which forms a concave shape that curves inward. By observing epithelial cell migration on flower-shaped substrate patterns that are used for wound closure assays, a research team led by MBI Visiting Faculty Prof. Benoit Ladoux in collaboration with MBI PIs BC. Low, Y. Toyama, theoretical physicists R. Voituriez, A. Callan-Jones and T. Shemesh and IBEC group leader Xavier Trepat found that at regions of positive curvature, cells developed lamellipodia for cell crawling, and at regions of negative curvature, strong actin cables assembled that followed the concave edge. Further observation of actin dynamics in real-time using live cell microscopy revealed a difference in the direction of actin flow at the two curvatures. In positive curvature induced lamellipodia, the flow of actin was retrograde, i.e. away from the cell membrane in the opposite direction to the protrusion. Conversely, at negative curvatures the actin flow was anterograde, i.e. towards the cell membrane where the actin cable was located. This anterograde flow drives the assembly of distinct, polarized actin structures at these regions of negative curvature. The actin cable at the concave edge is located at the front, followed by transverse actin fibres that are oriented in the same direction as the actin cable, and bringing up the rear of the network are radial actin fibres oriented at 90 degrees to the actin cable. Interestingly, the formation of these polarized actin structures in response to negative curvature was observed in single cells and cell sheets migrating on a 2D surface, and in cells embedded in 3D fibrous networks. While these results confirmed the existence of two mechanisms of cell migration, there was still an open question about how cells were able to sense to curvature of the environment. Fortunately, the live cell imaging provided with the researchers with a potential clue – the switch in the direction of actin flow depending on curvature could potentially be the ‘sensor’ for switching the mode of migration. This was confirmed by plating epithelial cells on a micro-patterned surface coated with adhesive substrate, which was dotted with non-adherent circular patches. When the cell sheet encountered a non-adherent circle, lamellipodial protrusions crawl around the circle, pulling the cells forward on the adhesive substrate. This automatically created a concave shape across the non-adherent circle, which caused a rapid switch in the direction of actomyosin flow from retrograde to anterograde, resulting in assembly of an actin cable and a switch in migration mechanism. The contractile cable can lift up the edge of the cell over the non-adherent circle, enabling migration of the cell sheet to continue. While cells do contain curvature sensors in their membrane, such as BAR proteins, these only allow the detection of curvature at the molecular level. Essentially, the size of these sensor proteins means that they can only sense curvature in their immediate vicinity at a scale of nanometres, not at the level of the whole cell. However, this study reveals how cells can sense larger cell-size curvature changes at a scale up to tens of micrometres, through dynamic adaptation of the actin flow. This ability allows the cell to select an appropriate mechanism to continue migration, even when faced with diverse changes in the physical environment, much like how an off road vehicle can switch between two- and four-wheel drive depending on the terrain. 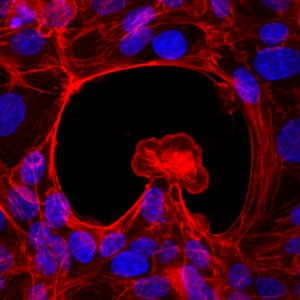 With the new knowledge of this actin flow switch, scientists may be better able to understand how cells can continue migration during wound healing, or in situations where migration can be damaging such as the metastatic progression of cancer.